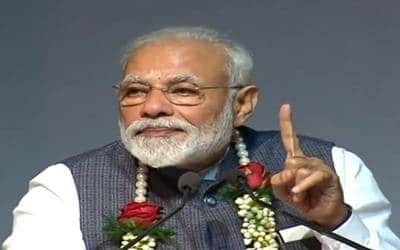 Lucknow, April 14 (IANS) Prime Minister Narendra Modi is slated to hold public rallies in Uttar Pradesh’s Aligarh and Moradabad cities on Sunday, according to a state BJP official. Manish Dixit, the media incharge for the state’s Bharatiya Janata Party unit, said Modi will campaign for Aligarh BJP candidate Satish Kumar Gautam in the city’s Numaish Maidan at around 1.30 p.m.
At 3 p.m., Modi will address the public at the Budh Vihar Circuit House in Moradabad in favour of party candidate Kunwar Sarvesh Kumar who is contesting the Lok Sabha polls from the constituency. Security has been heightened at both locations, said Additional Director General of Police Ajay Anand.